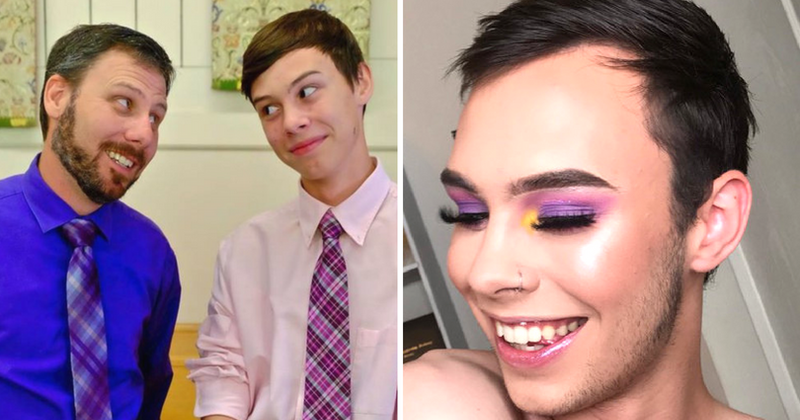 This dad had the best reaction to his son's makeup tutorial video and the internet is in tears! A YouTuber was in the middle of makeup tutorial when his dad walked in. Andrew Edgerton posted his dad's reaction on Twitter, and the whole internet fell in love. Andrew Edgerton, a vlogger, was in the middle of filming a makeup tutorial when his dad walked in. The YouTuber and blooming makeup artist posted his dad's reaction on Twitter. "That looks so. Freakin'. AWESOME," exclaims Andrew's dad. Pausing, Andrew looks up, blushes, and gushes a "Thank you!" His dad says "Damn!" off camera while Andrew giggles at his dad's praise. The YouTuber thanks his dad again and says that he's filming it. This 11-second video had the whole internet screaming in support of the amazing duo. The post was shared on Andrew's Twitter account and has gained over 327,000 likes. People have viewed the video nearly 6 million times. The internet welled up at Andrew's dad's reaction, and have praised the loving dad for his amazing support. Twitter users loved how supportive and encouraging Andrew's father Glenn was of his son. Some users said that the exchange made them cry because of how sweet it was. Many men are now rising to the ranks as makeup artists. Amongst some of them are MannyMua and James Charles, who became the first male spokesmodel and brand ambassador for Cover Girl. Andrew looks like he's headed towards something great, and he's got his dad supporting him all the way through. Glenn's reaction to his son's flawless makeup even caught MannyMua's eye.